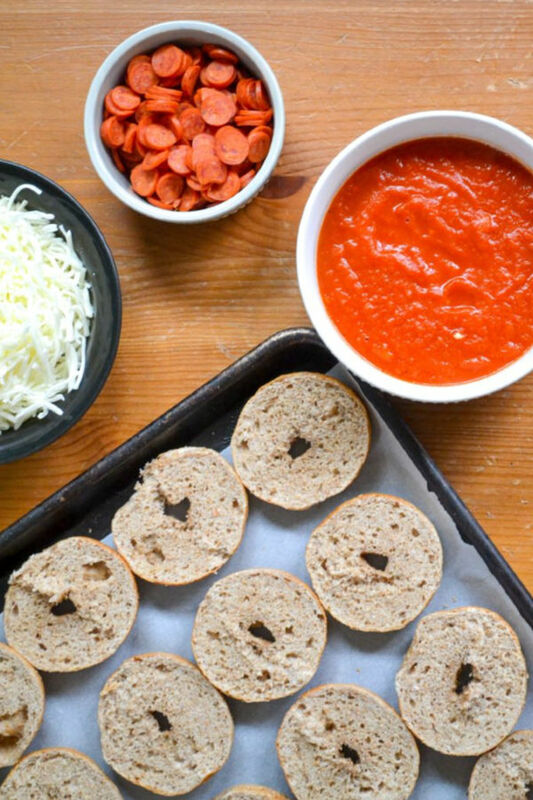 How to Make Pizza Bagels - with healthy pizza bagel options! Homemade pizza bagels are the perfect alternative to expensive frozen varieties. Learn how to make this simple snack perfectly every time. Kids will love helping you put together this simple kid friendly recipe. Customize with your family’s favorite toppings, tomato sauce and cheese. 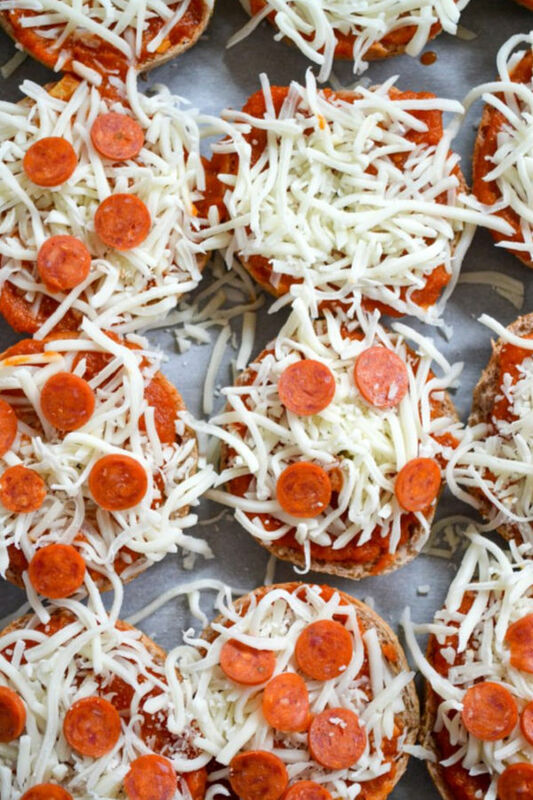 These pizza bagels are a homemade meal you can feel good about giving your kids. Bonus: they are easy to make ahead in bulk – have your kids help assemble and you’ll have freezer pizza bagels stocked for anytime. With gooey cheese, crispy bagels, and a hidden veggie sauce, this kid-friendly recipe is a win for both mom and kids! Growing up, pizza bagels were a staple. Sometimes they were homemade pizza bagels. Others they were store bought frozen ones, but regardless, we had them at least once a week. There was nothing better than gooey cheese, crispy bagel, and a soft, tomato sauce soaked center. One of the first things I learned to make after my parents divorced was how this simple dinner, lunch, or snack. From day one, Ryan’s favorite food has been pizza. While living in NJ means there are a plethora of some of the best slice places on every corner, it’s not always the most healthy option or most convenient. Yes, delivery is an option but when I’m hungry I’m hungry and I’m not waiting an hour for it to be delivered. Learn how to make pizza bagels at home and you’ll always have homemade pizza bagels on hand that your whole family will love. Soon I remembered my childhood favorite and made him a few. Of course, he immediately started asking for them every single time I asked what he wanted for lunch. He even conned my MIL a few times into making them any way possible. No, really, at just under 4 convinced her that ketchup and cheddar cheese was something momma made regularly. Insert puke emoji. Desperate times, I suppose? Anyway, like most of my kids’ favorite foods, I started searching for ways to one, make it easier and two, make it healthier. Yes, pizza bagels are about as easy as they come. But, if you don’t have one of the ingredients on hand the exact moment your kid starts begging for them you’re kind of out of luck. This brings up to healthy, homemade pizza bagels for the freezer. Making them yourself and storing in the freezer is perfect for a few reasons. You’ll be able to make dinner or lunch in just a few minutes. Finally, you know exactly what’s in them. No weird processed ingredients. It only takes three ingredients to learn how to make this snack. 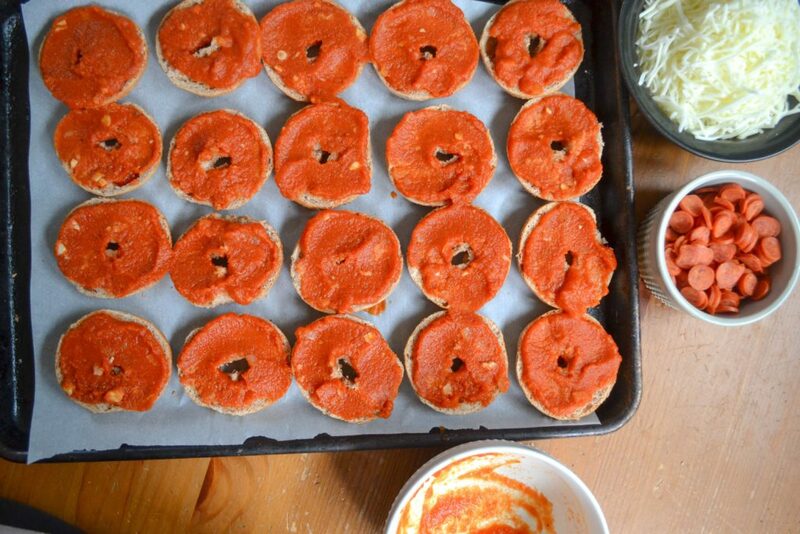 Adding a hidden veggie sauce and whole grain bagels make for healthy pizza bagels! A good pizza bagel recipe really just takes 3 ingredients – bagel, cheese, sauce. In this case, I used my hidden veggie spaghetti sauce as the base since it tastes just like pizza sauce. My kids have no idea. I also really like the local canned sauce I find at my grocery store. If at all possible, look for a sauce that’s a bit thicker to avoid a mushy base. Sometimes I cook my spaghetti sauce down a bit more, especially when I’m going to be freezing. Traditional sauces can be a bit watery for this use. Base – instead of a white bagel, let’s make whole grain mini pizza bagels. Grab a bag of whole grain bagels and use those. Sauce – instead of using a jar of pre-made sauce with questionable ingredients, I use my recipe for hidden veggie spaghetti sauce. Homemade pizza bagels with carrots? Heck yeah. Cheese – none of those weird ingredients that come in the store bought ones. Find a whole milk shredded mozzarella (bonus points – shred your own fresh mozz!) with an ingredient list you like. Other options include using just a sprinkle of quality Parmesan or using your fave cheese alternative. Toppings – I used mini pepperoni here, but in the past I’ve used diced peppers, olives, other veggies. The best part about homemade pizza bagels is being able to choose everything yourself. Okay, so you’ve got all the ingredients – how are we going to make this simple? Making in bulk and having a little helper. Oh, you heard me – we’re going to make 15+ pizza bagels at once, freeze em, and store them so you have freezer pizza bagels when you need them and we’re going to use the little who will inevitably eat them to help make ’em. Lay out all of your bagels. My boys LOVE separating the bagels and laying them down. Line a cookie sheet (make sure it will fit in your freezer!) with a sheet of parchment and line with the bagels. Add 1-2 spoonfuls of cooled sauce to your mini bagels. Have kids use a butter knife or small offset spatula to spread around the bagels. While the kids are spreading the sauce, chop any ingredients you plan on using as toppings. Chop small enough that they won’t overpower the bagel. Instruct the kids to sprinkle each bagel with cheese. It doesn’t have to be perfect! I used an entire bag of shredded cheese. Top with toppings. Again, another great task for little hands! Ask kids to gently press cheese and toppings on the bagel to make sure everything sticks once frozen. This is important, or storing will be a pain. You’re done! I pulled a few off and baked immediately (350 for about 5 minutes or until melty) and froze the rest. Once they are frozen, you can stack them and put into a zip top bag. When you’re ready to enjoy, pull out a few and bake at 350 for about 15 minutes. I get it. Cooking with kids can be a disaster. But this is a really fun recipe to get kids started on helping you out in the kitchen! There’s nothing hot or sharp and they really, truly cannot mess it up. Both my 2 and 4 year old helped me make them with minimal mess. Need some help boosting your confidence? Grab my Fearless kids cooking guide down below! You’ll have mini sous chefs in no time. Remember to rate this recipe 5 stars! It helps others find it and totally makes my day. Homemade pizza bagels are the perfect alternative to kid favorite frozen pizza bagels you buy. 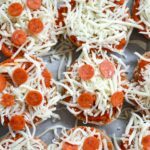 Customization with your family's favorite toppings, these healthy pizza bagels are a dish you can feel good about giving your kids. Separate and lay out all of your bagels on a cookie sheet lined with parchment paper. Add 1-2 spoonfuls of cooled sauce to your mini bagels. Top each bagel with cheese. Gently press cheese and toppings on bagel to make sure everything sticks once frozen. Freeze solid. To cook, bake frozen bagels at 350 for 15 minutes or until melted and golden. Okay so tell me – did you like pizza bagels as a kid? Do you know how to make pizza bagels? Let me know in the comments.